The past two weeks I've talked about training our children to do chores and take care of their homes and possessions. This week it's all about character. I stumbled across this great character curriculum called We Choose Virtues. It really filled a need with what I was wanting to do during our morning Circle Time. I was wanting to work in a character focus each month, so I was trying to figure out the 12 virtues I wanted to choose. Then I stumbled across We Choose Virtues which just happened to have exactly 12 virtues in their program! I quickly ordered it (especially since I had a coupon code handy!). I must say that the girls have taken to it like a duck to water. We choose a virtue to focus on for the entire month. The month of September was Patience and, October is Honesty. The rules are this: anytime I catch them exhibiting the chracter quality for the month, then they get to choose time out of our time bag to add to their screen time for the day (they each get 1 hour of screen time: TV, computer, Wii). If I catch them doing the opposite of our trait for the month, then they lose that much screen time out of the time bag (it's a zipper bank bag that has cards in it that say 10, 15, 20 or 30 minutes, about 5 of each). The fun part for them is that they get to watch me and hubby. When they catch us not being patient or honest, then they have our permission to call us out for not showing the virtue that month. I got called out a lot during patience month (ugh, why can't they just get in the car! ), but by the end I was much more aware of not letting my exasperation rule my attitude. On the back is an easy to memorize definition, so that kids can understand exactly what it means to be patient, honest, etc. 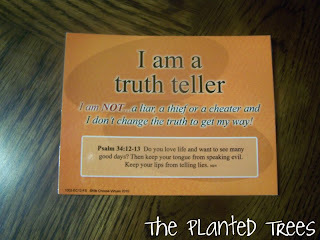 We memorized patience to a chant with hand motions, and we are working on memorizing honest to a rap. 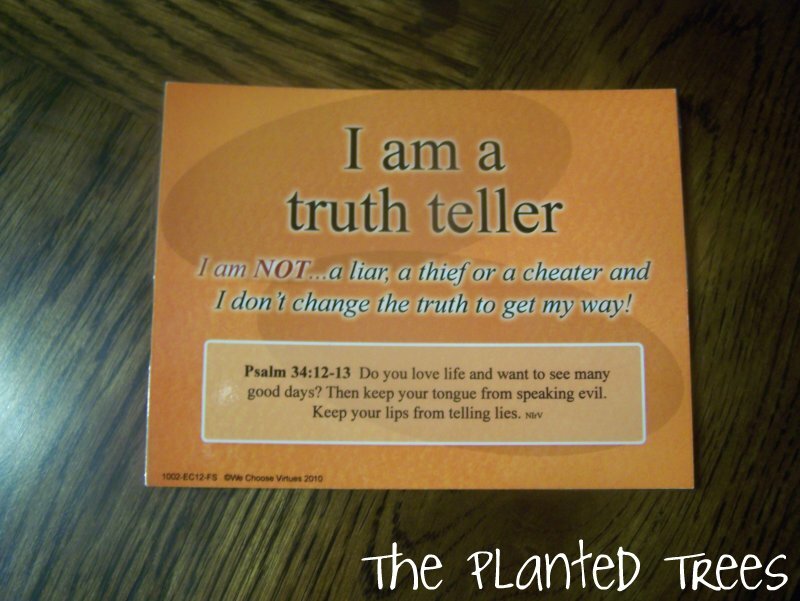 They sell the cards with Bible verses on the back and without, but, of course, we chose the Bible verses. 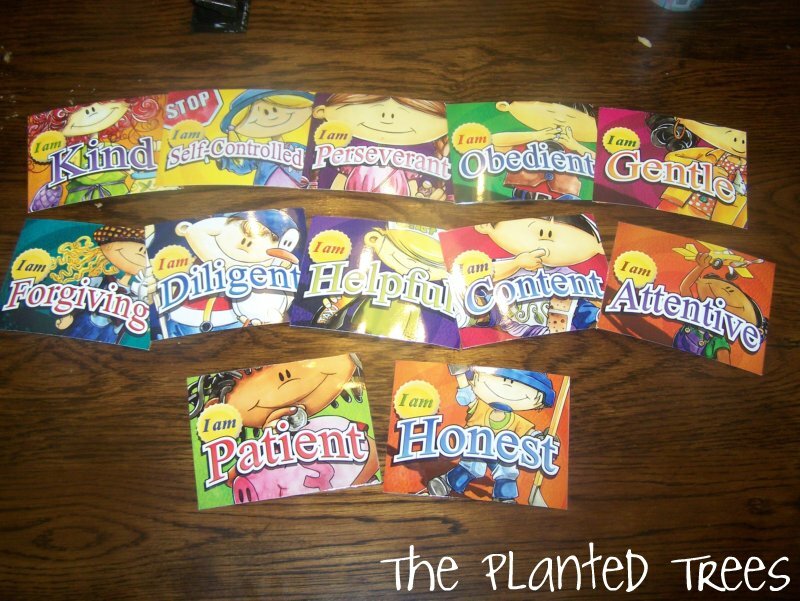 I am currently working up a list of children's books to exemplify each chracter virtue so that we can read a book each week to reinforce our character training. I can already tell such a HUGE difference after just one month of using these cards. If someone begins acting impatient, all I have to do is ask, "Are you showing patience right now?" and they know exactly what I mean and correct it. Hopefully, you will figure out a way to incorporate some character training into your family's busy schedule. Cause let's face it, they aren't going to pick up on it from living in this world! I would love to have a copy of that book list when you're finished with it!